Migrants are being issued with backpacks full of supplies, given to them by the UNHCR, and more often than not the migrants throw them away once all the supplies packed therein are used up. In the bags left behind, leaflets have been found, from a group of Open Society Foundations - Welcome to Europe, aka W2eu - which is closely linked to the American millionaire, George Soros. These leaflets are guides in Arabic and English languages, which encourage migrants to form groups and immediately call for an attorney if they are faced with border-guarding officials. 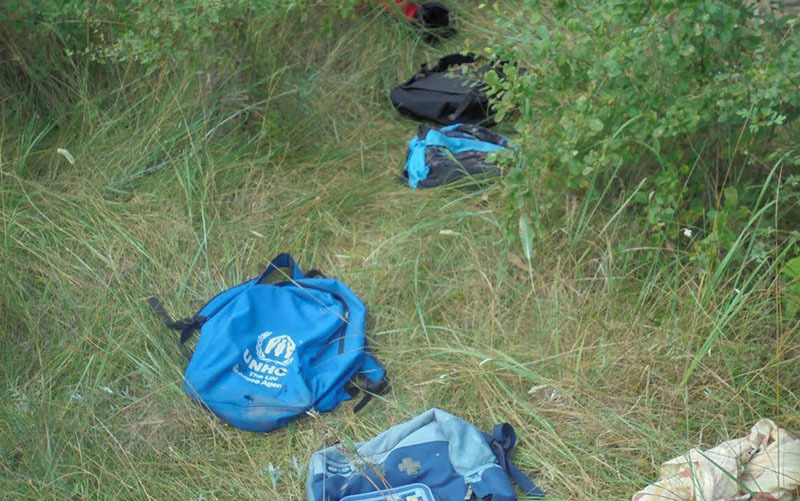 At least 500 invaders were caught breaking through a Hungarian border fence two months ago, and among their possessions were UNHCR backpacks, supplies, and leaflets from a Soros-front instructing them on how to break the law. The most shocking of these documents was one which encourages migrants not to have their fingerprints taken, stopping authorities detecting criminals and terrorists. Taking fingerprints was not only required by the EU’s own rules, but that it was the “only chance to find criminals and terrorists” among the already registered so-called refugees. These leaflets also advise younger migrants to give false information about there age because a minor cannot be taken into custody and cannot be deported, even if they have no papers. This is very interesting, especially if we think about the case of the IS terrorists Muhammad Riyad, see below who attacked 15 people in a train in Germany. 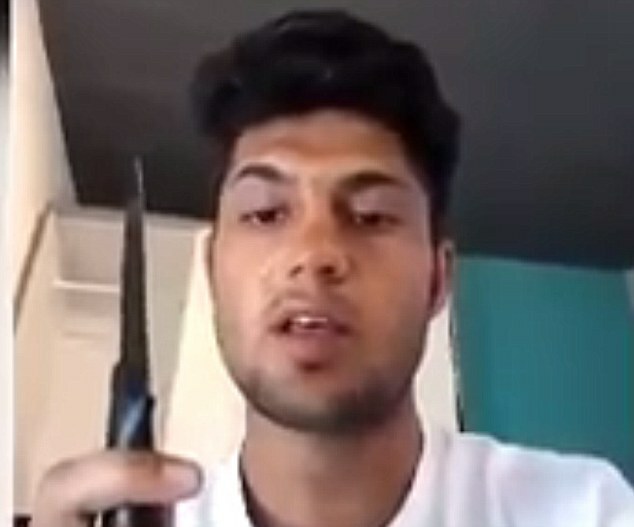 The 19-year-old attacker, who has been named as Muhammad Riyad by ISIS, was gunned down by armed police after fleeing the scene near the city of Wurzburg, 70 miles north of Nuremberg. Alexandra Mezher, a young female nurse, 22, was stabbed to death at child migrant home, Molndal, Goethenburg, Sweden, in January. 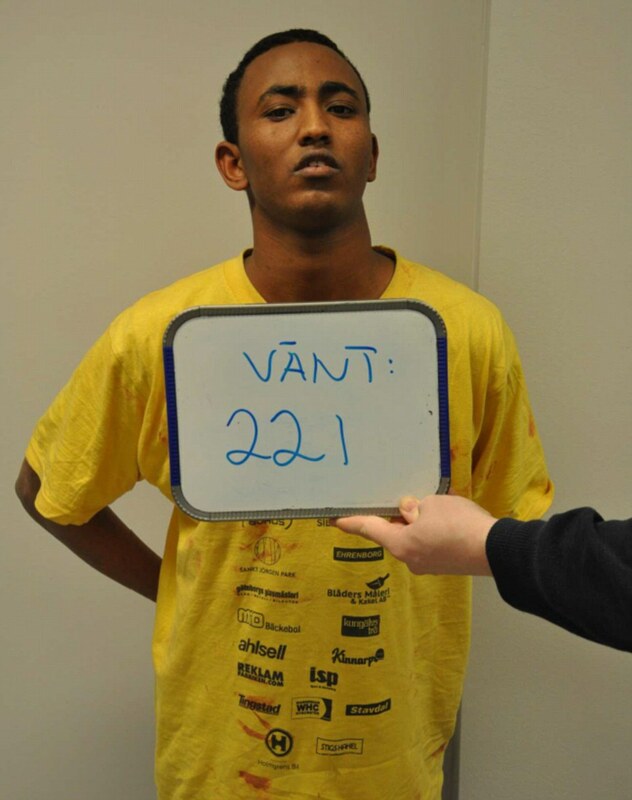 When Youssaf Khaliif Nuur was questioned by Swedish police he claimed he couldn't remember the incident. The Mayor of the Hungarian border town, Ásotthalom, a Mr Toroczkai, revealed that he personally had, along with his town’s police force, captured 320 invaders who broke through the fence last month, and that an additional “several hundred” were captured in the fields and woods around the town, which lies near the border with Serbia. This meant that the number of invaders getting through near his town was minimal, but it also meant that the Third World invasion flow through the Balkans route had not stopped, only slowed down. Mayor László Toroczkai on "Facebook"
If you have given your fingerprints to authorities in Bulgaria and you don’t stay there but continue your journey, you might get threatened to be deported back to Bulgaria. This is based on the so-called Dublin-regulation. So far there is a general (temporary) deportation stop to Greece (that means no deportation to Greece because of the fingerprints) but not to any other EU-countries (like Bulgaria for example). Usually, the country, in which you apply for asylum, will take your fingerprints upon registration to compare them with data from other EU-countries in the computerized system called Eurodac. The authorities will also ask you, which way you arrived (your travel route). Based on this information, the authorities will decide if they are responsible to process your asylum application or if another country (that you passed through earlier) is responsible for that. If they find your fingerprint or any other information to prove that you have been in another EU-country (other than Greece), they will ask this country to take you back. If this country does not refuse within the legal time frame or does not answer at all (within 2-3 months after your fingerprints have been taken in the country of arrival), you will receive a letter informing you about your scheduled deportation. The good news is: in many cases the people, who had to give their fingerprints in Bulgaria will not be deported back in the end. According to our experiences, particularly in 2015, we would even say that fewer and fewer people are deported. Fingerprints from Bulgaria or any other country cannot be “deleted” or “cleared”, but there are certain time limits for the deportation. So for example after Bulgaria became responsible for you, there is a time limit of 6 months to carry out the deportation. IMPORTANT: it isNOT 6 months from your arrival in another country, but six months after a date that can only be found in your file in the migration office. You need help to understand your personal time limit. This time limit can be extended to 18 months if you were “hiding”. Information: Unaccompanied minors (under the age of 18) have no legal limitation to stay in any specific country. They can even apply for asylum several times within Europe. As long as they don’t receive any papers they can move freely. If they are fingerprinted in Bulgaria for example and registered there falsely as adults, in some countries (Germany for example) they will still not be sent back if registered as under-aged in the country where they finally decided to stay. Beware that this practice does not apply to all EU countries. We know for example that the Netherlands consider the age you have given in your first interview in an EU country as decisive. That means if you have been registered in Bulgaria as an adult, you will be an adult in the Netherlands as well. Beware that you have to register your asylum application with the competent asylum authority before you turn 18! Beware, that in the moment you are made older by the authorities after an age-testing and you are not registered as a minor, it is again different! Like in most other struggles, you can succeed to stop a deportation if you are able to build a team. For your team you need some experts: counselors who have knowledge about Dublin-deportations and how to stop them, most probably also a lawyer, maybe a good doctor and/or psychologist. And most importantly: friends who will support you to not give up. 2) Document your own story in Bulgaria! In order to document the bad living circumstances, mistreatment and human rights violations which you suffered in Bulgaria, collect photos and any other forms of evidence that show your problems there, keep a copy of papers from doctors or NGOs about illnesses or injuries if possible in your Facebook or email-account to be able to get it back later. It is also helpful to write down in advance all your stories of persecution plus all difficulties you encountered on the road to and through Europe. There might be traumatizing experiences you yourself don’t consider important but which your lawyer can use to argue against your intended deportation. Maybe you can write down some data and stories already now. Many people for example tend to forget the name of the prison they were kept in or the date when they were imprisoned. What is very important to mention: if you have experienced pushbacks at the border, if the police and/or military of Bulgaria have beaten, kicked or threatened you, if you have been imprisoned, if you have been homeless or without food for longer times. 3) Contact support groups and look for counseling after arrival! If you had to give fingerprints in Bulgaria, you should contact support-groups in your country of arrival as soon as possible. In most countries and in most cases you will also need a lawyer. Seek advice from support groups for contacts to good, experienced lawyers to prevent a deportation based on the Dublin III Regulation to Bulgaria. In some countries (for example in Germany) lawyers are very useful in the procedure. Usually they take money for supporting your case. Even if you lack money, you can probably arrange to pay the lawyer in monthly rates with the social welfare money you get from the state where you seek asylum – it makes a lot of sense to invest this money. In other countries (for example France) lawyer work for free and/or are paid by the state. The moment when you receive a letter with a deportation order is the latest moment when YOU HAVE TO SEEK HELP of a lawyer IMMEDIATELY. There is only one week time for the lawyer to appeal before the court against your deportation. In the best case you will have already taken a lawyer in advance and you will be prepared to fight against your deportation. Don’t wait until the last moment! The chances to stop a deportation to Bulgaria in front of a court are often given, because many judges know that the situation in Bulgaria for refugees is very bad. If you have any family members in the country where you registered and where want to stay, explain to your lawyer and the authorities why you rely on the help of your relatives or why they rely on you. This dependency can be another factor supporting your claim that you cannot be returned to another EU-country, or example, if you have your elderly mother who cannot take care of herself, or an underage relative with no other family members nearby etc. It is good to mention all sorts of family links – authorities can decide not to follow the Dublin-procedure because of family links. Beware: In many countries there are many new asylum applications right now so the asylum system including the registration system and the comparison of fingerprints is blocked sometimes for weeks and even months. The resulting delays lead in some cases to the expiration of time-limits defined in law concerning the Dublin deportations so that a forced return based on fingerprints cannot be carried out anymore. The more time is passing by, the better for you. BUT your lawyer needs to check the time limits by himself by getting your permit to look into your file. Fingerprints in Serbia or even asylum application in Serbia have no effect at all on your asylum case in any other European country, since Serbia has not signed the Dublin agreement. Croatia and Slovenia, up to now, usually don’t take fingerprints for Eurodac, but only for their national security checks. There is no guarantee that this stays like that forever, but up to now there have not been any deportations to Croatia and Slovenia carried out based on the fingerprints taken there since this summer, when many people started going to Northern Europe by crossing these two countries. W.Europe is without hope and invaders pour in unabated. Civil unrest and breakdown of law and order is the norm Shiria law enabled by the EU leaders is a given. Citizens refuse to stand up for family and heritage, not knowing their history. See: gatesofvienna.net, pamelageller.com,etc. Be respectful Thomas, this American woman is no whore and believes in the 2nd Amendment.